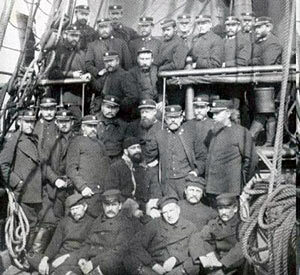 W. S. Schley and his relief expedition crew with the six survivors of the Greely Expedition, June 1884. Source: Reynold, Francis J. The United States Navy From The Revolution To Date, New York: P. F. Collier & Son, 1918, p63. Adolphus Greely leads an American expedition to Ellesmere Island as part of the First International Polar Year (1882-1883) to set up a new observation station in the Arctic. His junior officer Lt. Lockwood establishes a farthest north, breaking the record that had held for three centuries. Only 6 of the 24 expedition members survive.